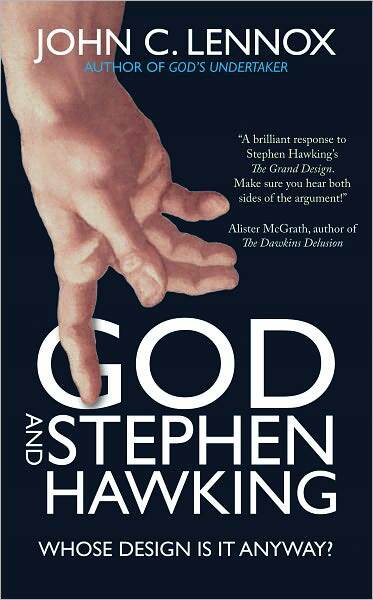 God and Stephen Hawking; Whose Design Is It Anyway? by John C. Lennox is a small book with a big message. It is written by John C. Lennox as a response to Stephen Hawking's The Grand Design, in which the claim is made that the universe created itself from nothing... that the laws of physics brought the universe into existence rather than being created by God. John C. Lennox shares his views as a fellow scientist and points out that "not all statements by scientists are statements of science, and so do not carry the authority of authentic science even though such authority is often erroneously ascribed to them." And he adds that this applies to himself as well. This is a very informative book and I enjoyed reading it. Although, I found myself having to re-read many parts of it as I it was a bit over my head. That being said... I will read it again as I am very interested in this subject. It is clearly laid out and I did find that I learned a great deal if I took it a bit slower to comprehend what I was reading. I may not retain all that I read, but I will certainly keep this handy for future conversations. I found it to be a valuable resource and I am happy to have had the chance to review it. I hope I did it justice. I recommend this book for anyone interested in this popular debate, regardless of which side you are on. *Litfuse Publicity Group has provided me with a complimentary copy of this book for my honest review. ~Thanks!